The story opens with Manny (the mammoth. Get it?) hauling out the traditional Christmas rock. This is to alert Santa to come visit his daughter, Peaches. There are so many things wrong already. I know that the Ice Age movies aren't making any attempt to be scientifically accurate, but the level of disregard for sense or logic in this makes me angry. I was maybe holding out a little hope that there would be some reason they (in the Ice Age, so perpetual-ish winter) would have a winter holiday that just happened to be named Christmas. But no. No explanations for anything. Just a magical gift-bringer who comes at Christmas, which is... now? There's no calendar. There's no mention of the solstice or the new year. There's some mention of "spirit of the season" and "Christmas magic" without any reference to what those phrases could possibly mean for these characters. Stuff happens and the designated-idiot character Sid breaks the rock. Manny says that he's on the naughty list (which he just made up). Sid's upset, but Manny tells his wife that no adults are dumb enough to believe in Santa. Peaches overhears this and gets mad. Maybe this would have meant something if there had been more than a few moments in the special at this point devoted to something other than broad slapstick, but this is the first indication we have that Santa is a myth. Why would animals even come up with a mythical gift-bringer? Why would it be something they would lie to their children about? And, (the thousand dollar question in many a special, but more significant in a land with no civilization or trade) wouldn't the adults KNOW if the children had been receiving mysterious gifts in previous years? At any rate, Peaches, Sid, and a couple other characters sneak off to find Santa and... prove he's real, which they could do instead by just waiting six hours. They fall off a cliff, at which point I was hoping the special was over, only to be rescued by a flying reindeer. Prancer brings them most of the way to the pole, where they are stopped by an army of sloth warriors who are protecting Santa for some reason. 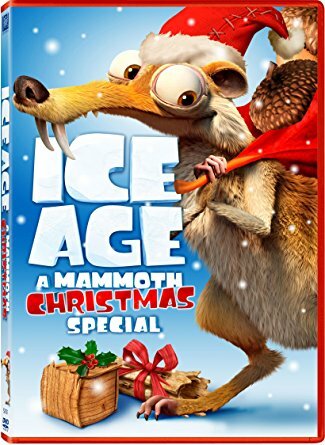 Manny and the other characters are searching for them nearby at this point (despite the fact that the other characters had to fly to get where they are), and shenanigans with the reindeer cause an avalanche that kills them all. I wish. They're all swept down into the North Pole (somehow, despite being on the other side of the ridge), destroying Santa's work. Santa, by the by, is HUMAN. Not even prehistoric looking at all, just a vaguely old-timey Santa. And he can create a list out of nothing with magic, but not rebuild toys. He doesn't seem to have had any previous encounters with flying reindeer, so they're just a mystery. And he brings gifts because... why not, I guess? Why... I just... ARGH. The characters decide to pull together (with the not insignificant help of the sloth army) and remake all the presents during a boring singing montage. Prancer fetches the rest of his family and with all this help, Santa can deliver around the world! I guess if your kids are really young and you're incredibly lazy, this special has one benefit. It will not make you explain the existence of any type of holiday other than the one celebrated by most of the current-day United States. After all, according to this, Christmas and Santa have existed in basically the same form forever, so you never have to challenge that idea with the presence of other cultures or historical truths. Hooray for the power of revisionist history.